The skipper for the day was Cory, recently returned from two months of vacation in Australia (so that’s what Hawaiians do to get away). Also on the crew were Chef Stephen, Bartender Austin, and Crewman Robert. The four of them were really funny, very friendly, and made the trip fantastic. We started off by leaving the harbor, and on our way out we happened across some turtles out for a swim, and at the mouth of the harbor a pod of spinning dolphins came up and joined us on our journey into open water. We knew it was going to be a great trip. After cruising all the way up the coast nearly to Ke’e Beach with another pod of dolphins joining us for a swim off the bow (video to come later), we turned back south, hoisted the main sail, and got a little sailing in. 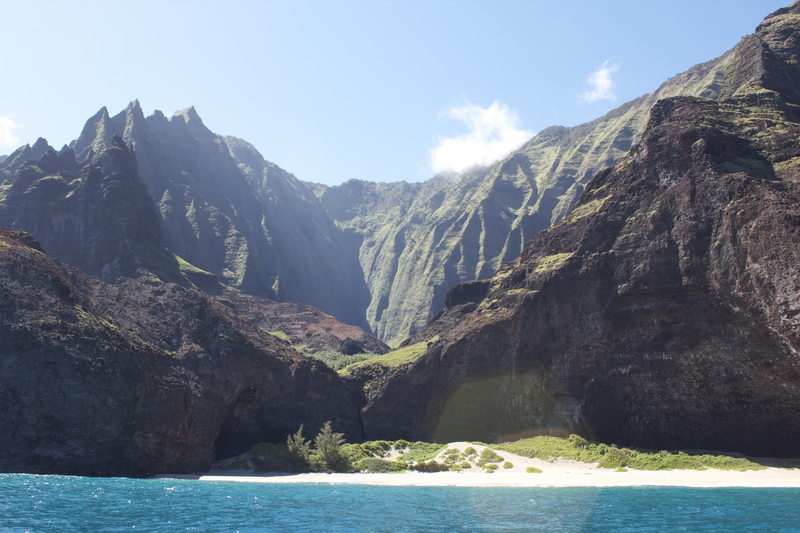 We went back to the southern end of the Na Pali Coast for some snorkeling. A few colorful fish, but the best part was near the end when a turtle went swimming through and we followed him along for a bit. We got back on the boat for our BBQ lunch and some drinks (many thanks to Austin for the hook-up) and headed back towards Port Allen. As we were standing enjoying our drinks, another passenger came up to me and said he’d heard me tell someone I was in the Marine Corps. It turned out that even though we didn’t recognize each other in vacation mode, we had both just graduated from the same class in Quantico. I introduced him to Ben and my new in-laws, and he realized that he had seen us before–on CNN when we were engaged at the White House last December. Small world!! We talked to a number of other passengers as well; it’s amazing the connections you can make with people when you just start talking to them. 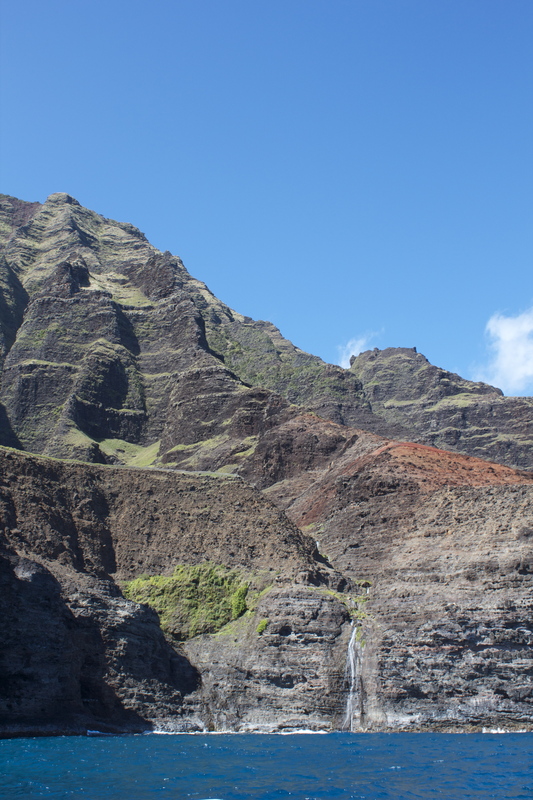 After we got back to Port Allen, we disembarked, thanked the crew, and headed back toward Poipu Beach. We stopped for some shaved ice along the way in Koloa and made it home just in time to pass out for a nap. We laid low for the rest of the day and enjoyed another meal at the house with the family. Everyone was exhausted, so it wasn’t a late night. The next day in Kauai will be our last, but what a great week it’s been!! This entry was posted in Honeymoon, Travels. Bookmark the permalink.